[MOBILE, ALABAMA, April 6, 2017] Hackbarth Delivery Service recently expanded their footprint with the opening of 11 terminals throughout the state of Texas. The new locations include Abilene, Amarillo, Austin, Corpus Christi, Dallas/Fort Worth, Lubbock, Midland, McAllen, San Antonio, Waco and Tyler. These new markets opened with service to approximately 1,200 delivery points distributing 13,000 packages per day, and created nearly 150 jobs. 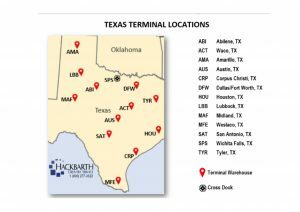 With this expansion, along with an existing terminal in Houston, Hackbarth virtually offers statewide coverage throughout Texas. These new locations will further the company’s growth strategy by seeking to align with customer partners who value high-service standards for time critical shipments. Service offerings in these markets include: same-day and overnight package delivery; pool-point distribution; white-glove delivery; line haul services; warehousing; and customized logistics solutions targeting last mile delivery. These new terminals create increased opportunities to be a single-source solution for their clients. Hackbarth Delivery Service now has 36 terminals and six additional cross-docks in their growing network of transportation and warehousing solutions. 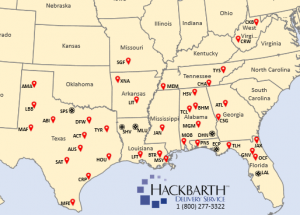 Hackbarth is the fast, last mile provider covering 10 states across the Southern, Midwestern and Mid-Atlantic regions of the United States.